This coming weekend Fun Palace is coming to Bedford! Fun Palaces is a national event to encourage both science and arts education, inviting people to bring them together however they choose. This year the Fun Palace is coming to Bedford for the first time with lots of different events and workshops taking place on the 3rd/4th Oct.
Keeping in with the theme for this year’s Fun Palace; ‘Everyone an Artist, Everyone a Scientist’ Bedpop have got many events including a sound and light tunnel at the Higgins, a paper engineering contest, coding lessons, theatrical workshops and we, emc design will be sponsoring the Circus of Illustration‘s Robot Lab workshop. 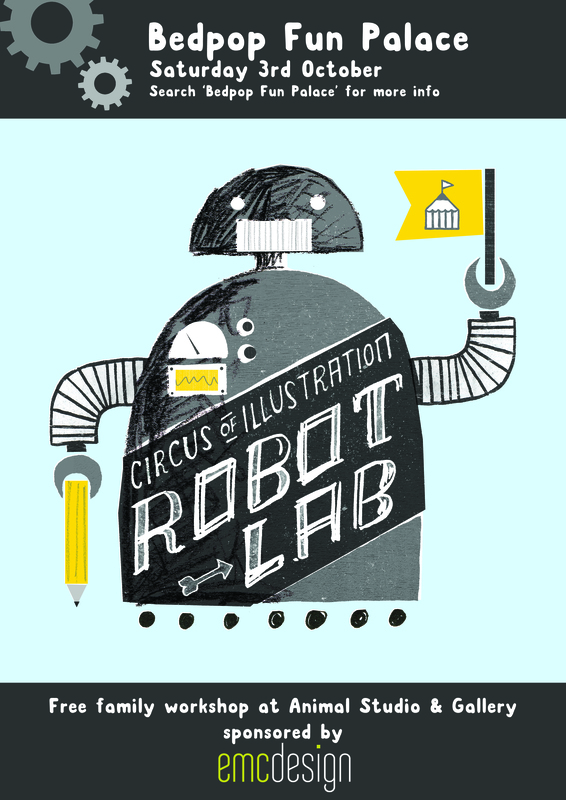 The Robot Lab will be taking over Animal Studio and Gallery on Sat 3rd Oct with paper-crafted robot foldee building, colouring, activity sheets and general artsiness to inspire everyone! So make sure to come down and join in the free workshop fun! The full programme of events can be found here with lots more info to be found on social media platforms.